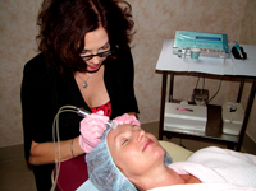 Permanent Makeup at the Jacksonville Cosmetic Surgery Center | Permanent Makeup in Jacksonville. Can you imagine having immaculate, perfectly polished makeup 24/7? No more wasted time with a lengthy morning makeup routine and gone would be your worries about smudged eyeliner and patchy lipstick. All of this (and more!) is possible with permanent makeup. But what is permanent makeup and how does it work? Keep reading to find out everything you've ever wanted to know about permanent makeup. In very simple terms, permanent makeup is much like getting a tattoo, both in terms of the process and the end outcome. The procedure involves depositing hypoallergenic mineral pigments into the dermal layer of the skin. Who is permanent makeup suitable for? Generally speaking, permanent makeup is suitable for anyone who wants the convenience of having perfectly applied makeup all of the time. It is also a good choice for individuals that are allergic to conventional cosmetic products and makeup or who wear prescription glasses. Many individuals who have disabilities and impaired motor function also find permanent makeup valuable. Women over the age of 50 are also great candidates for permanent makeup as often they can begin to lose color around their lips and the shape and thickness of their eyebrows and eyelashes can decrease. While there are many different machines and pieces of equipment you could use for permanent makeup application, in our Jacksonville Cosmetic Surgery Center we choose to exclusively use the Nouveau Contour Digital 700. This piece of state of the art equipment is made in the Netherlands and is the very first computer-controlled device for use with permanent makeup in the world. We specifically selected this equipment as it ensures consistent needle frequency even in the face of skin resistance. In technical terms, this means that the Nouveau Contour Digital 700's digital control unit will maintain the preset needle speed so that per second needle puncture rate remains consistent. Comparatively, the traditional analogue machines (which are used by over 90% of permanent makeup practitioners in Jacksonville), rely on a plugged in DC outlet or power supply to manage needle frequency and the speed of pigmentation. This is important, because by using the computer-controlled device we be assured that our patients have the highest level of safety and quality with their permanent makeup application. The Nouveau Contour machine also takes the guesswork out of selecting the right needle speed and needle configurations for each procedure to ensure maximum enhancement of your natural beauty. Permanent makeup is a very precise process (and art!) and generally speaking, irreversible. For this reason, it is vital that you choose an extremely well trained, talented and professional permanent makeup specialist. The end result of your permanent makeup procedure will depend in large part on the skill of your specialist and the quality of the equipment they use. It's important to understand that no cosmetic procedure is completely risk free, and there are some potential side effects of having permanent makeup applied. In unsanitary environments, it's possible to contract a staph or Hepatitis infection and not everyone responds to the procedure the same way. In some cases, skin issues such as keloid formations have arisen after permanent makeup application. There are also reports of allergic reactions and while these cases are rare, it is still a risk worth considering. We recommend researching this topic thoroughly if you are concerned, or calling our resident permanent makeup specialist if you have any questions. Your eyes are the windows to your soul. But what happens when your eyes are communicating tired, sleepy and dull rather than fresh, attractive and young? Here at Jacksonville Cosmetic Surgery Center, we have found permanent eyeliner and lash enhancement to be one of our most popular treatments. This is because permanent eyeliner and lash enhancements are the best age defiant procedures available. They ensure that your eyes are framed with color and shape and appear animated, lively and appealing. If the eyes are the windows to the soul, then the eyebrows are the frames. Eyebrows are crucial for framing and adding depth and dimension to your face. Don't believe us? Try removing your eyebrows in a photo and see what a difference it makes to your appearance! Permanent eyebrow application is incredibly popular as it helps to reinvigorate and frame the face. As we age, our natural brow tends to thin at the arch. This is important as the arch actually gives a lift to our cheekbones. So when you lose this arch, it affects your face's dynamics. But with permanent eyebrows, you can regain this arch, fill in sparse eyebrows, add shape and lift your eyebrows. This treatment is also perfect for anyone who has old piercing scars, has over tweezed, suffers from scarring or alopecia or wants to regain their eyebrow line after chemotherapy. Do you have a confident, breath-taking smile? Or have your lips become thinner and lost their shape with age? If so, there is a solution! Defining your lips by adding even the slightest amount of color can help you regain your self-confidence again. Permanent lip color can help you restore your lip line, camouflage scars, and reshape irregular lips to help you have supple, full and young looking lips that are both feminine and youthful. The recovery after permanent makeup is no more than few hours. We recommend cool compress on the area treated for 15 to 30 minutes. The cold compress will reduce swelling and help the healing. The treated area should not be exposed to sun, salt water, and swimming pool water for two weeks.